'Sherlock Holmes 2' Character Poster released! 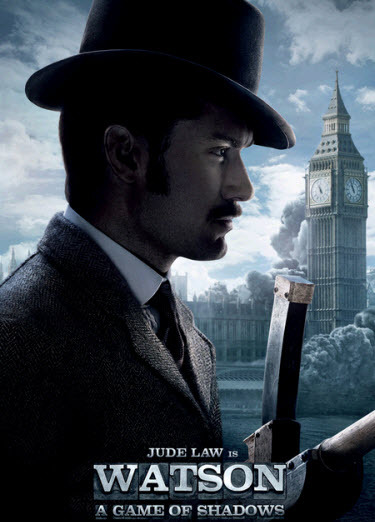 The one-sheets feature the individual characters of bestfriends Holmes and Watson, played respectively by Robert Downey Jr. and Jude Law. The sequel reunites director Guy Ritchie with stars Downey and Law, as well as producers Joel Silver, Lionel Wigram, Susan Downey and Dan Lin. In the film, Sherlock Holmes has always been the smartest man in the room…until now. There is a new criminal mastermind at large—Professor Moriarty (Jared Harris)—and not only is he Holmes’ intellectual equal, but his capacity for evil, coupled with a complete lack of conscience, may actually give him an advantage over the renowned detective. Jared Harris (TV’s “Mad Men,” “The Curious Case of Benjamin Button”) joins the cast as the notorious Professor Moriarty. Also joining the cast, in her first English-speaking role, is Swedish actress Noomi Rapace, who gained international attention in the Swedish film “The Girl with the Dragon Tattoo.” Stephen Fry (“Alice in Wonderland,” “Harry Potter and the Goblet of Fire”) plays Mycroft Holmes, Sherlock’s older brother.